Ralph & Alice, Norton & Trixie Bus Ride! 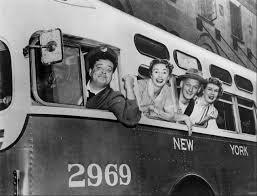 We can think of a number of memorable movie and television bus drivers. Sandra Bullock in Speed took the viewers on a crazy, nail biting city bus excursion, one where she had to keep the pedal to the metal in order to maintain 50 mph so the rigged chassis bombs did not trigger. In Billy Madison, Chris Farley turns into an over the top angry school bus driver, uttering the memorable, “I’ll turn this damn bus around,” as his sweaty face turns an intense shade of scary red! But in all of Hollywood lore, there is no more endearing character than Mr. Ralph Kramden, city bus driver for the Gotham Bus Company! 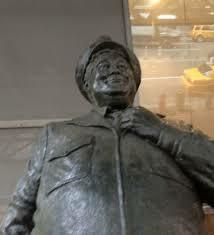 One thing is certain – (Jackie Gleason’s character) Ralph was super dedicated to the craft of driving a NYC bus. He LOVED his job and took it very seriously. He enjoyed the blue collar aspects of it – even if his apartment with Alice had minimal, frugal furnishings and appliances. Winning a contest for Best Bus Driver or helping an old lady during the afternoon made Ralph’s day, and he enjoyed being above ground as opposed to subterranean employment in the sewer like his pal Norton. His beloved wife, Alice, was proud of his accomplishments, and always expressed how much she loved him just the way he is. “Honey, YOU’RE the GREATEST,” was the way Ralph reacted to his sweetheart’s praise – and many of these classic black and white TV episodes ended exactly like that! Compared to the 1950’s, so much in our world has changed. Equipment wise, the bus vehicles from decades ago were so basic in contrast to what we have today. A big steering wheel, brake and gas, gears to shift, noisy engine in the back, and no air conditioning. A modern bus – even in municipalities – is a refined, well-oiled machine. Communication systems, climate controls, energy saving features, and abundant safety equipment. – all components that would have Kramden up late at the kitchen table reading the owner’s manual with trusty Norton right there to annoy him! …and Ralph would have loved it! A professional bus operator is still an excellent career. Driving thousands of people to their desired destinations daily, to and from work, school, doctor’s appointments, sporting and entertainment events, family visits – providing safe and comfortable travel. Moving out of the inner cities, a tour bus operator or scheduled travel bus line driver takes people on long distance trips, connecting passengers with their locations out of town, and often far away form home. Ralph Kramden Would Have Loved to get out of Town! If only Ralph could have gotten behind the wheel heading up the NYS Thruway through the fall foliage or winter wonderlands.